Life imitates art and art imitates life. After watching “The Best of Enemies” earlier this week, I can only hope and pray that life imitates the art of war depicted in the film. The rise of the Ku Klux Klan came to a grinding halt when faced with the opposition of one Ms. Ann Atwater. As leader of “the invisible army”, it was only right that CP Ellis face off with the Klan’s enemy in Ms. Atwater, blacks and white liberals who supported their cause. The films gives viewers a somewhat unprecedented view inside the inner workings of the Klan. In the film, the virulent christian hypocrisy and ideology unfolds and shows just how connected the Klan was and possibly still is in communities around the nation. Durham Klan activity in 1971 wasn’t as clandestine as before, but blacks like Ann Atwater had had more than enough. She was fed up and from her office at Operation Breakthrough made sure that blacks in Durham had the representation they deserved. The film centers around the fight for school integration in Durham and Ellis and Atwater find themselves on opposite sides of the table arguing for each side. The sworn enemies were on first name basis and neither shied away from their disdain for the other. As was customary in the fight for civil rights in America, lawmakers and public officials sought to skirt the law when in favor of blacks. When the cause came before a judge who was to rule on the matter, it was passed back down to Durham, Ellis and the Klan and Atwater and Durham’s blacks. Enter, Bill Riddick. Did anyone ever think that a film about school integration would teach you something new? Of the many takeaways from the film is this word: charrette (a sha-what? I asked from my seat in the theater). Defined as “a meeting in which all stakeholders in a project attempt to resolve conflicts and map solutions”, Durham hosted a charrette to decide the matter of school integration. It was during this grueling two week process that Ann Atwater and CP Ellis’ worlds collided. “Don’t fire until you see the whites of their eyes!” This quote from the Revolutionary War and its many variations have been attributed to William Prescott, Israel Putnam and even President George Washington. Regardless of its origin, it’s clear that its necessity was precipitated by either scarcity or proximity. The soldiers need not waste any shots, but needed to be close enough before firing their weapons. Ann Atwater and CP Ellis engaged in the art of war, but it wasn’t until they were close enough to see the whites of each others’ eyes, that they really got to know their enemy. Distance is a great divider and for many Americans today, we yet remain too far away to understand our enemy…our neighbor. In the bible the lawyer asked Jesus “who is my neighbor” (Luke 10:29) but this film and the larger than life kinship of Ann Atwater and CP Ellis begs the question: “who is my enemy?” As the two were forced to face both the threat and hope of school integration together on opposing sides, they along with other members of the community discovered a common truth. We are more alike that we will ever be unlike. Howard Clemente surmised that CP Ellis also shared the same fears for his children as a parent, but with her deep connections in the community and beyond, Ann Atwater knew that “CP” knew something about being helpless. Something came into our lives those two weeks we spent working together on the “Save Our Schools” meetings. The blinders came off and we both saw that our fighting one another wasn’t doing anything to help the children. We didn’t become friends because we wanted to. What happened, really, was we saw how much we had in common. Then we couldn’t imagine not being friends. The coals of fire burned not only on Ellis’ head, but deep in his heart. He was called out and called upon to lead the charge against desegregation, but instead became a casualty of war, when Atwater weaponized godly love. So often we ask “Who is my neighbor?” when we should instead inquire: “Who is my enemy?” Given the larger than life kinship of Ann and “CP”, we can eliminate the hand to hand combat of hate with heart to heart engagement. 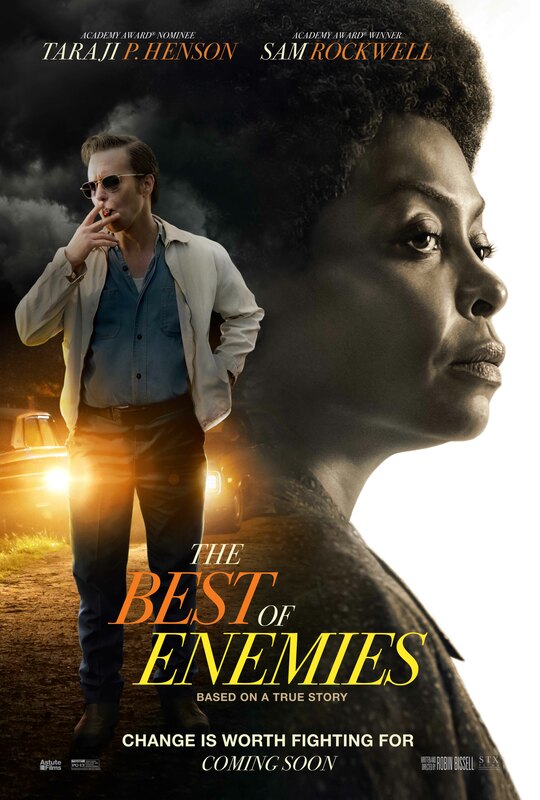 Our own Fred Willis attended a screening of “The Best of Enemies” starring Taraji P. Henson and Sam Rockwell. The film centers around the fight for school integration in Durham and Ellis and Atwater find themselves on opposite sides of the table arguing for each side. Who Is My Neighbor, Enemy, Brother/Sister? Hate is a by-product of fear and as this movie enlightens us, our greatest fear is sometimes that our brothers and sisters are the people we today consider to be our enemies. CP Ellis and Ann Atwater remained friends and toured the country speaking and sharing their story. Their bond was much more than a friendship, as Atwater eulogized CP when he passed away in 2005. Durham schools weren’t the only thing desegregated in 1971, CP Ellis welcomed and gladly served his first black customers at his gas station. Timing is everything and I believe that the release of this movie is the precipice upon which we can build and re-build dialogue in this country that will tear down the walls we build with racism, apathy and hate. There are many more Ann Atwaters and CP Ellises of the world today, many whose stories were never told. And with racism again tearing at the fabric of what we esteem to be a more perfect union, there will hopefully be more to come! The Best of Enemies opens in theaters, Friday April, 5th.